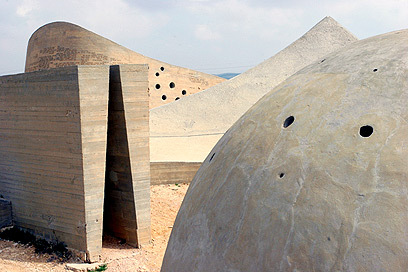 In the years 1963-1968 Dani Karavan designed and built this monument on a hill overlooking the southern city of Beersheba in memory of the members of the Palmach Negev Brigade who fell defending Israel during the War of Independence. Forty years after its construction the monument is still considered to be a unique example of memorial monuments. The Ad Halom Bridge near Ashdod marks the northernmost point in Israel to which the Egyptian army advanced during the War of Independence. The bridge itself was destroyed in 1948, but after the war it was reconstructed and near it a commemoration park was established, including a wall commemorating the soldiers who fell during the battles in the area. As part of the Camp David Accords between Israel and Egypt a monument in the memory of the fallen Egyptian soldiers was established. It was compensation for the abandonment of Israeli obelisks in the Sinai Peninsula. The inscriptions on the four edges are in Hebrew, Arabic, English and hieroglyphs. In the beginning of 2008, 11 years after the helicopter disaster, a monument honoring the memory of the 73 soldiers who were killed in the air collision was finally inaugurated. 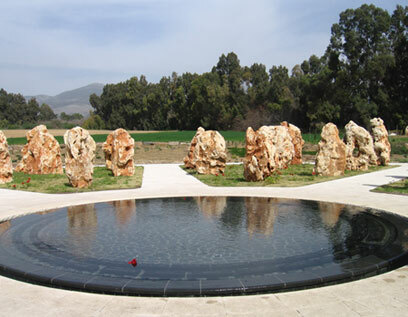 The monument is located near Kibbutz Dafna's cemetery in northern israel. At the site, which is built in the shape of a helicopter, there are 73 large rocks representing the 73 fallen soldiers, and another rock on which their names are engraved. 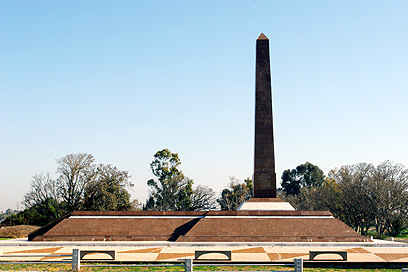 Between Hulda Forest and Hulda Junction stands the "heroism monument" dedicated to the Engineering Corps and the memory of the soldiers ho fell in the battles to break the siege on the Jerusalem during the War of Independence. At the memorial site concrete planks have been erected carrying the names of all Engineering corps soldiers who fell in Israel's wars since the State's inception. Recently a large amphitheater was built at the place in which military memorial ceremonies are being held. 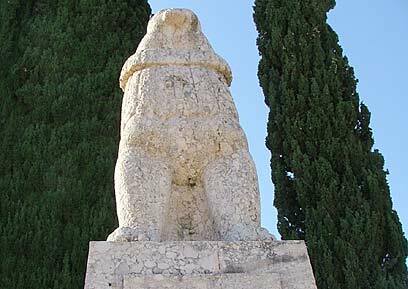 One of Israel's first memorials is the statue of the lion in Tel Hai, in memory of the eight who fell in the battle of Tel Hai in 1920, and whose names are engraved on the statue. The monument was designed by Avraham Melnikov and over the years it became a national symbol. The commemoration site and museum for the Golani Brigade is located near Golani Intersection in the Upper Galilee. The museum documents the brigade's history and offers a movie and a light and sound show. Tours at the site are provided in Hebrew, English and Russian. At this site, which served as a Jordanian military post in northern Jerusalem, one of the toughest and bloodiest battles of the Six Day War took place. The compound was erected by the Brits during the 1930s and originally served to store ammunition. The Jordanian post relied on the dozens of fortified bunkers built at the spot. In 1975 a memorial site was inaugurated at the place, as well as a museum commemorating the fallen soldiers. The names of the 182 soldiers who died defending Jerusalem are engraved on the museum's wall and 182 olive trees have been planted on the hill. In 1982 the place was declared a national memorial site. See all talkbacks "7 fascinating memorials"